Preservation New Jersey (PNJ), along with the New Jersey Historic Preservation Office and Historic Sites Council celebrated individuals, organizations, and agencies that have made a major or sustained impact within the field of history and historic preservation in New Jersey at an awards ceremony at Passaic County Community College’s historic Hamilton Club during the 2018 New Jersey History and Historic Preservation Conference. “Every year, we are more and more impressed by the dedication and creativity of both the volunteer and professional preservation community in their efforts to save, restore, and promote NJ’s historic resources,” PNJ’s Executive Director, Courtenay Mercer said. “We are privileged and honored to recognize these efforts through the annual NJ Historic Preservation Awards. The Armed Forces Heritage Museum (AFHM) received the New Preservation Initiatives Award recognizing organizations, individuals and agencies that have created new initiatives and new opportunities for preservation, education, and/or community engagement in New Jersey. The New Jersey Military Mobile Museum project was born out of the AFHM mission to “Preserve, Honor, and Educate all on the history of the military in New Jersey and the surrounding areas.” The original aim was to build a fixed museum on the Joint Base McGuire-Dix-Lakehurst that would facilitate public access currently not available due to Base security access restrictions. This fixed museum approach encountered difficulties in obtaining the necessary regulation considerations for its development. Consequently, Armed Forces Heritage Museum decided to pursue a mobile museum approach in bringing New Jersey’s military history to the public. 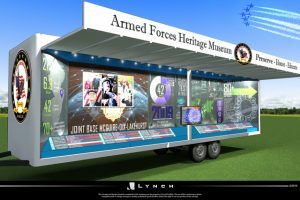 Through the donation of a mobile stage trailer that was being replaced by Ewing Township leadership, the AFHM was able to refurbish and retrofit the unit into a set of displays within its 32-foot-long exhibit area. The exhibit “stories” were developed by a dedicated team of AFHM members and brought to reality through the vision of Lynch Exhibitors in Burlington, New Jersey. The Armed Forces Heritage Museum also has online resources of archival materials, and a wonderful living history documentary series, some of which is incorporated into the mobile museum. Since its launch in June 2017, the New Jersey Military Mobile Museum enjoyed a successful inaugural season with displays at nine events. Future plans include the design and development of a larger, 53-foot mobile unit that will house an array of interactive exhibits covering at least the past 200 years of New Jersey military history that will travel state-wide. The City of Plainfield received the Historic Preservation Commission Award recognizing local historical commissions that have undertaken new initiatives, provided long-term quality work to their community, or successfully overcome recent obstacles. The Plainfield Historic Preservation Commission (HPC) is one of the oldest active commissions in the state, having been enacted by ordinance in 1981 and continuously serving as a leader or “model” local commission in the state since. One of Plainfield’s best assets is its vast stock of historic homes and properties that are the envy of Central New Jersey. Once known as the “Wall Street Suburb,” Plainfield has some of the finest examples of turn-of-the-century Victorian, Colonial, Craftsman and Romantic house styles in the area, and is home to 10 local historic districts and 9 individual landmarks. The HPC fosters civic pride in the accomplishments of Plainfield’s past by promoting the use of historic districts for the educational, cultural, and recreational welfare of its residents, and helping to insure the harmonious and efficient growth of the City. To accomplish this mission, the HPC has nine members and two staff professionals who attend all meetings and present an amazing array of talent, including three architects, two planners, two lawyers, and a veteran Historical Society leader. Members of the HPC serve on the Architectural Review Committee, present lectures at state conferences, lead walking tours, host a history fair, and interact very effectively with the other local land use boards. 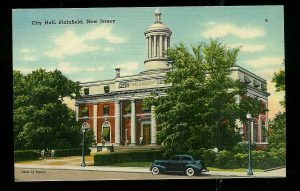 Plainfield’s HPC and its professionalism have been at the forefront of New Jersey historic preservation planning for many years. The commission has participated in preservation legal issues involving federal statutes and county parks, enacted a robust design guidelines booklet (now translated into Spanish), and provided other technical assistance, including spearheading local surveys, National Register nominations and wood window workshops. The Princeton Battlefield Society received the Visionary Stewardship Award recognizing organizations, individuals and agencies that have shown long-term and quality commitment to the use of a historic resource, and/or the field of historic preservation in general. The Princeton Battlefield Society is a nonprofit organization managed by volunteers that was formed in 1971 with a broad mission of preserving, protecting, and promoting the Princeton Battlefield State Park and the heritage of the American Revolution’s Battle of Princeton. The historic park became a National Historic Landmark in 1961 and in 2012 was designated as one of America’s 11 Most Endangered Historic Places by the National Trust for Historic Preservation. Since 2003, the Princeton Battlefield Society has legally challenged the Institute for Advanced Study’s (IAS) efforts to build faculty housing on land identified in a National Park Service American Battlefield Protection Program grant-funded study to be Washington’s Charge Site, i.e. the area of the battlefield where General George Washington boldly rallied his troops, and for the first time defeated British regulars to establish his military leadership. In 2015, the Civil War Trust formed a partnership with the Princeton Battlefield Society in this preservation and protection effort, and assisted with national fundraising, marketing, and media initiatives. 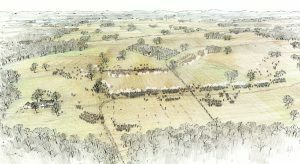 Efforts to save the Washington Charge Field occurred while the Princeton Battlefield Society continued to plan programs and services of education, volunteer involvement and living history demonstrations. A compromise with IAS was won in 2017, and the acquisition of 15 critical acres to expand the park will occur soon. Through the years, Princeton Battlefield Society has planned and organized on-site living history programs for families, historic educational programs, Park Clean-up Days, studies to reinforce the battle’s significance and the site’s cultural landscape, restoration efforts on behalf of the Thomas Clarke House, and cooperative ventures to purchase adjoining historic properties. William “Bill” Schroh, Jr. received the Visionary Stewardship Award recognizing organizations, individuals and agencies that have shown long-term and quality commitment to the use of a historic resource, and/or the field of historic preservation in general. Bill Schroh, Jr. and the Liberty Hall Museum have been vital in upholding an outstanding partnership in helping build Heritage Tourism for Elizabeth and the State of New Jersey. Mr. Schroh has been a catalyst in building the historic segment for the City’s tourism office by paving the way for a collaborative approach to museum visitation across multiple Elizabeth historic sites. He has made a significant public impact on the community by leveraging rich historic assets to drive visitation to the area that enhances tourism as a driving force of economic development. Mr. Schroh has led a team of professionals, delivering custom tour experiences, providing a unique approach to programming, and drawing domestic and international audiences from all age levels. This includes unique and engaging programs for children. Mr. Schroh brings heritage tourism to an unprecedented level in providing tourists a quality historic attraction that incorporates a modern technological approach. Some examples include: working with Kean University students on developing exhibits using augmented reality and online experiences; Room of Echoes: Seeing the same room over three centuries; Liberty Hall 360: The re-enactment of the 1774 wedding of John Jay and Sarah Livingston; enhancing ADA experiences using iPad FaceTime capabilities for inaccessible parts of the museum; and State-of-the-art drone and video footage promoting select historic tours. Some of the many tours and programs Mr. Schroh has curated and executed include: hosting a Toast to America in conjunction with the Portuguese Consul General; highlighting the new Madeira Wine Exhibition at Liberty Hall; hosting a regional Yelp vendor event; tours for Royal Caribbean Cruise Line as part of the Elizabeth, NJ Excursion Experience; and working with Premiere Stages at Kean University to create plays based on unknown pieces of New Jersey history. Camden High School Parent Teacher Organization & Matthew R. Litt, Esq. 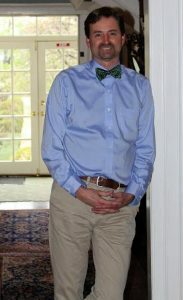 The Camden High School Parent Teacher Organization & Matthew R. Litt, Esq. received the Preservation Advocacy Award recognizing organizations, individuals and agencies that have shown great dedication to advocating for the preservation and/or restoration of an individual site. Camden High School, known locally as “The Castle on the Hill” and constructed 1916-1918, is an imposing three-story Collegiate Gothic structure that combines architectural terra cotta with smooth-dressed Indiana limestone and rough-textured brick. It was designed by Paul A. Davis III (1872-1948), one the most influential of the city’s Beaux-Arts trained architects. Despite restoring the building’s tower for $4 million dollars in 2009, the New Jersey School Development Authority (NJSDA), the State’s school construction arm, in 2016 announced plans to demolish the entire building, including the newly restored tower, to build four small academies on the site. In response, the Camden High School Parent Teacher Organization (PTO) organized efforts to save the Castle on the Hill through grass-roots activism, public relations and fundraising campaigns, letters to the Governor, and coordinating an application for listing on the State Register of Historic Places (receiving a certificate of eligibility in January 2017). 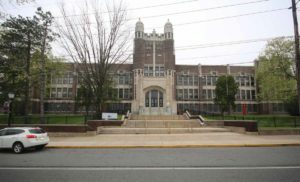 In 2017, Preservation New Jersey named Camden High School to its list of the 10 Most Endangered Historic Places in New Jersey. Subsequently, the PTO filed suit in the US District and then Camden County Superior Court, prepared and argued by Matt R. Litt, Esq. Demolition of portions of the structure began at the end of the 2016-17 school year, with an assurance to delay demolition of “more significant” portions of the structure pending the outcome of the lawsuit. Ultimately, the high school’s Register nomination was never heard by the State Review Board; and, legal efforts failed at Superior Court. Without sufficient resources for further appeal, the Camden High School PTO halted its efforts. While the Castle on the Hill was lost, the tireless effort put forth by dedicated residents, alumni, students, and parents are worthy of acknowledgment. Fred Carl received the Sarah B. Fiske Legacy Award, which is a lifetime achievement award recognizing important and sustained contributions to the understanding and promotion of historic preservation and history in New Jersey. Fred Carl has been a champion of Camp Evans since 1993, when its closing under base realignment and closure (BRAC) was announced. 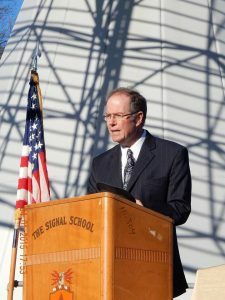 With the backing of Wall Township, Mr. Carl researched the creation of a science center, and presented The Marconi Reuse Plan in 1995. Fred built a consortium to preserve Camp Evans that incorporated in 1998 as a not-for-profit known as the InfoAge Science-History Center. Mr. Carl researched the history of Camp Evans and was able to get it listed on the State Register of Historic Places in 2001 with hope of national recognition to follow. In 2002, Camp Evans was listed on Preservation New Jersey’s 10 of Most Endangered Historic Places; and with PNJ’s public relations assistance and Congressman Chris Smith’s intervention, it was listed on the National Register later that year. This paved the way for the Township to acquire the property. Prior to the turnover, the Army stopped maintaining the buildings. In 2003, the Army removed the sanitary sewers and contractors cut the underground electrical feeds. It took intervention by Representative Smith and attorneys from the National Trust for Historic Preservation to rectify these actions. The buildings became infested with mold, and lead paint was also an issue. Mr. Carl obtained a license to remediate lead-based paint; and on his own time and at his own expense, he remediated nine buildings. In 2006, eight buildings on 17 acres were transferred to Wall, but none of the buildings were ready for occupancy. InfoAge, with support from Wall and Monmouth County InfoAge, replaced the roofs, installed heat, and added air conditioning to five buildings. In addition, nine restrooms were restored to service. InfoAge repainted the exteriors of the WW2 and satellite era buildings, and the entire interiors of seven buildings. Mr. Carl and his fellow volunteers continue the work of restoration as they raise funds and establish educational science-history programs. 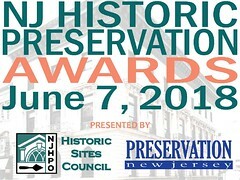 More information about the project awards on the NJ Historic Preservation Office at http://www.nj.gov/dep/hpo/4sustain/awds2018.htm.